Thanks for the really quick fix Ooiks; efficient as ever. Cheers!. Script isn’t working for me, only thing it does is show “Timer cannot show on title page. 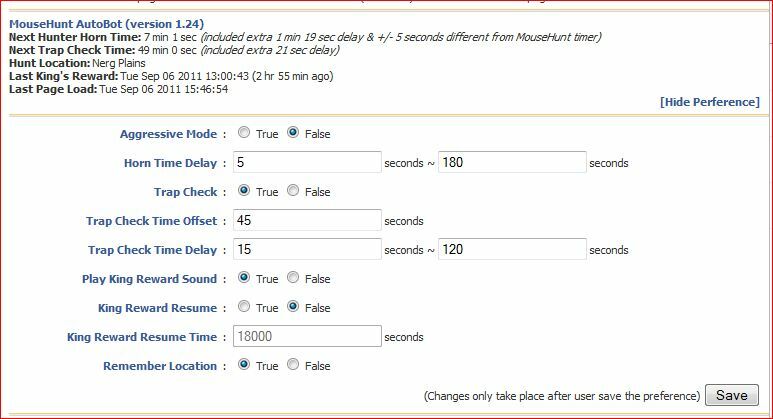 You can run MouseHunt without iFrame (Facebook) to enable timer on title page” on the top of the page. When I click that and run MouseHunt without the iFrame, the script is running but nothing happens. It looks the same as if I didn’t install it. Make sure you have uninstall any previous version of the script and try clear the browser cache to see if it work. Yes, but let me fix all the bug first. hi there, i having trouble here..
the browser i using is opera 11.50.. Thanks for the really quick fix. Yes, but not in the next coming version. Because I need to push the bug fix for Opera on version 1.25 first, mobile version will be 1.26 if can. Is working now. do you enough any problem? Hey what does remember location do? If u not in the location the horn wont sound?